Add wireless Bluetooth to any speakers with the Vamp Stereo | What Hi-Fi? The Vamp Stereo has power enough for two speakers, while the Vamp Speaker is a standalone wireless speaker made from recycled materials. The team behind The Vamp, a small, seven-sided device that adds Bluetooth connectivity to standard speakers, has created a Kickstarter to fund two new products: the Vamp Stereo and the Vamp Speaker. The Vamp Stereo has the same functionalities as the Vamp – containing a Bluetooth chip, amplifier, and battery – in order to bring wireless streaming to any set of speakers. The new Vamp Stereo is designed to deliver Bluetooth to two speakers and can do so for up to 10 hours and from a range of 10 metres. Just connect via analogue audio connections and stream music from any Bluetooth device. Not got any old speakers? 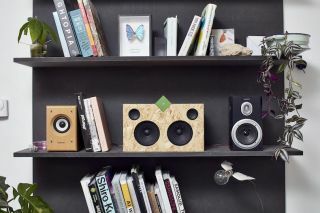 There's always the Vamp Speaker, an environmentally-friendly Bluetooth speaker. The box is made of sustainable OSB board, while the electronic components are made out of recycled materials. The Vamp speaker can also be connected to two additional speakers if you want more bang for your buck. According to the company, “the sustainable aspect has kept the speaker on-message with the spirit of The Vamp, which is reusing and recycling”. Head over to the Kickstarter page for more information.